Roll On/Roll Off Shipping | Get Free Car Shipping Quotes Now! Roll on/Roll off shipping is a method of car shipping that is commonly used to transport cars and other vehicles to overseas destinations. The term refers to a form of auto shipping in which vehicles are driven on and driven off board a special purpose transport ship rather than lifted onboard and lifted off the ship via cranes. Unlike container shipping, in RoRo shipping, cars are transported on open car decks on board Roll on Roll off vessels. 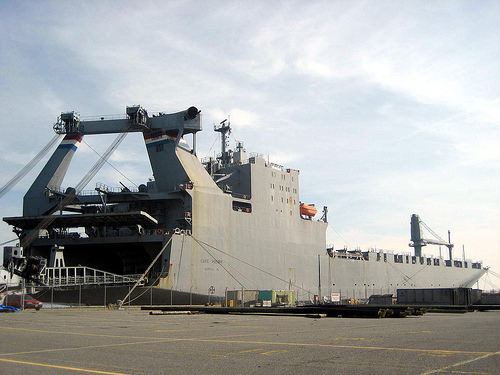 RoRo carriers are basically custom-designed vessels that are equipped to transport any sort of cargo that can be driven or wheeled on board the ship. The ships have large on-side ramps than can be lowered to a dock to allow cars and other vehicles to be driven on and off the vessel. The ships feature large multi-level parking decks with clearly marked lanes for parking cars. Large RoRo carriers can easily transport between 200 and 300 vehicles at once. Some RoRo vessels are designated as Pure Car Carriers (PCC), while those that transport both cars and trucks are referred to as Pure Car Truck Carriers (PCTC). Automobile manufacturers were the first ones to use such ships to export cars to other countries. Over the past two decades though, Roll on/Roll off car shipping has become an increasingly common method for transporting cars, trailers, trucks and other vehicles between countries. One of the reasons for the growing popularity is the cost associated with RoRo services. Roll on/Roll off car shipping is often much cheaper than container shipping. In fact, RoRo shipping can sometimes be between 40 percent and 50 percent cheaper than container shipping, depending on the port of origin and destination. Though RoRo services are often considered to be less secure than container shipping, many people still use RoRo carriers simply because of the enormous cost benefits. The cost for shipping a car is based on the size of the vehicle. The larger the volume of space occupied by the vehicle, the more it will cost to ship the vehicle. All shipping companies have a base ocean freight rate per cubit foot of volume. They take this base rate and multiply it by the volume of the vehicle to calculate the shipping rate. Some roll on/roll off shipping companies may then add surcharges, such as a Bunker Adjustment Factor, on top of the base rate to arrive at a final figure.